Blackjack Atlantic City by iSoftBet follows the rules of the classic blackjack, but contains some “minor” differences. They all favor the player, so this will be the perfect version if you are new at blackjack. 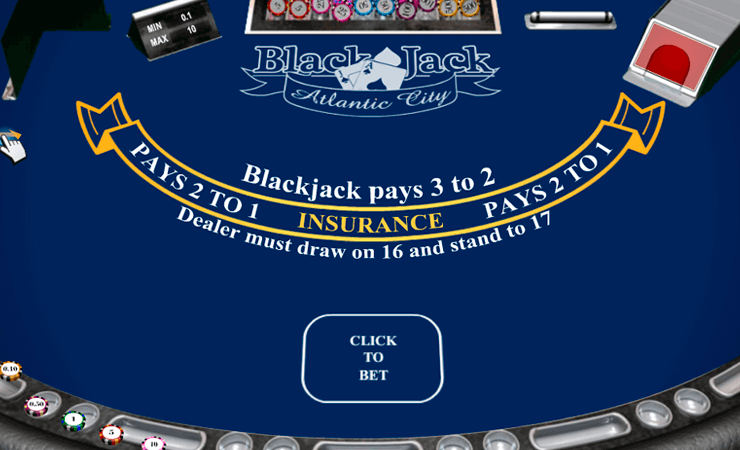 The interface looks good enough – it is a realistic but static image of a blackjack table. As you can see, it has only one betting box; this version of blackjack plays only between the dealer and the player. To start the game, click on the “new game” button. Both sides will get two cards, visible. The goal is to reach a total of 21 or a total higher than the dealer. You can hit (ask for more cards) or stand (no more cards) according to your hand. You can also double down your cards, which also doubles your wager. Late Surrender: Player can late surrender, even after the dealer has checked for blackjack. By late surrendering, you only lose half of your wager. Splitting Rules: You can split up to three times, and play with a maximum of four hands at the same time. Doubling Down: After getting your first two cards, you can choose to double down irrespective of your hand. Doubling down is also allowed after splitting. House Edge: House edge of Atlantic City blackjack games are %0.36. Blackjack Atlantic City is played with eight decks. We recommend always splitting your hand if you get a pair of Aces. Do not split if you are holding a pair of 10s – you must always stand at this total. If you have a total of 16 and the dealer has a total of 10 or 11, consider surrendering. Blackjack Atlantic City is a nice variation of the classic game, and it is simple enough for beginners. You have a balance of 1.000 coins in the demo mode, and it can last for hours if you follow these simple tactics. Whether you are practicing or learning the game, Blackjack Atlantic City will be a good choice.